Developing Mathematical Ideas (DMI) is a professional development curriculum designed to help teachers think through the major ideas of elementary and middle-school mathematics and examine how students develop those ideas. At the heart of the materials are sets of classroom episodes (cases) illustrating student thinking as described by their teachers. 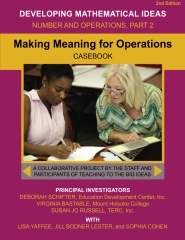 In addition to case discussions, the curriculum offers teachers opportunities: to explore mathematics in lessons led by facilitators; to share and discuss the work of their own students; to view and discuss DVD clips of mathematics classrooms; to write their own classroom cases; to analyze lessons taken from innovative elementary mathematics curricula; and to read overviews of related research. Thanks to the support of the Bill and Melinda Gates Foundation and the National Council of Teachers of Mathematics, two of the Developing Mathematical Ideas modules have been revised to highlight the connections to the Common Core content and practice standards. 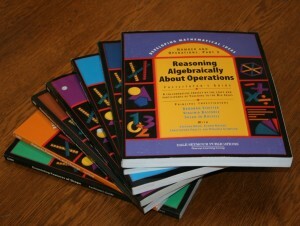 Revised modules (third edition) will be available through NCTM beginning December 2015. For facilitators who already have the second edition of the facilitator’s guides, supplements that contain the revisions to the guides can be found here. DMI consists of seven modules, each designed for eight 3-hour sessions of professional development. Participants examine different attributes of size, develop facility in composing and decomposing shapes, and apply these skills to make sense of formulas for area and volume. They also explore conceptual issues of length, area, and volume, as well as their complex inter-relationships. Participants work with the collection, representation, description, and interpretation of data. They learn what various graphs and statistical measures show about features of the data, study how to summarize data when comparing groups, and consider whether the data provide insight into the questions that led to data collection. Participants examine generalizations at the heart of the study of operations in the elementary grades. They express these generalizations in common language and in algebraic notation, develop arguments based on representations of the operations, study what it means to prove a generalization, and extend their generalizations and arguments when the domain under consideration expands from whole numbers to integers. Participants discover how the study of repeating patterns and number sequences can lead to ideas of functions, learn how to read tables and graphs to interpret phenomena of change, and use algebraic notation to write function rules. With a particular emphasis on linear functions, participants also explore quadratic and exponential functions and examine how various features of a function are seen in graphs, tables, or rules. Each seminar is built around a casebook containing 25 to 30 cases, grouped into seven chapters, which track a particular mathematical theme from kindergarten into middle school. Casebooks begin with an overview of the seminar, and each chapter contains an introduction intended to orient the reader to the major theme of the cases in that chapter. They conclude with an essay summarizing the ideas explored in the seminar through the lens of educational research or from the perspective of a mathematician. The DMI Facilitator’s Guides include detailed agendas for each session. Other components are intended to help facilitators: understand the major ideas to be explored in each session; identify particular strategies useful in leading case discussions and mathematics activities; plan seminar sessions; and think through issues of teacher change. The DMI DVD Cases show students in a wide variety of classroom settings with children and teachers of different races and ethnic groups. While written cases allow users to examine student thinking at their own pace, returning, if necessary, to ponder and analyze particular passages, the DVD clips offer users the opportunity to listen to real student voices in real time and provides rich images of classrooms organized around student thinking.